"When Sharon asked me if I wanted to go to see Shrek with her as she had been invited to review it for her blog, I was thrilled. Even though it is primarily aimed at children (and we were not taking ours), I love seeing musicals and having seen the film years ago, I was interested to see how it had been adapted for the stage. However, on the day, Sharon’s youngest was ill and she was unable to go. She asked if I could take someone else and review it for her. It was such a shame that Sharon couldn’t come but as they say; ‘the show must go on’ (or in this case the ‘review must go on’), and I found a friend happy to accompany me. We arrived at the Theatre Royal Drury Lane and were kindly given our tickets and a programme. Now I never buy programmes but I really liked this one. It was beautifully designed and gave good background information on all the cast and my 3 year old son loved looking at the pictures the next day (and now wants to go and see it). We went to the evening show which is actually a really good time to see it. I imagine the matinees are much busier and it was great to not have to queue for drinks or the toilets at the interval! We had great seats which enabled us to get a close up view of the cast and their fantastic costumes. I won’t go into the story of Shrek as I can’t imagine many people don’t know it. If there is anyone out there who hasn’t seen it, it is essentially a love story about an Ogre and a Princess, with a vertically challenged self obsessed Lord who wants to be a King, a host of fairy tale characters and a talking donkey. From the opening scene, involving many disgruntled fairy tale folk, we were taken on a colourful musical journey, meeting some brilliant characters along the way. 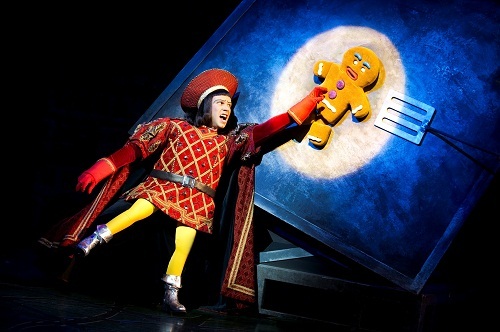 Lord Farquaad in particular is excellent and raises the most laughs by far. I liked that they made Fiona slightly more narcissistic and sarcastic than in the film – referring to herself as bi-polar in the scene in the tower where she is impatiently waiting for her prince, ranging from hopeful romantic to a crazy female obsessed with being rescued. 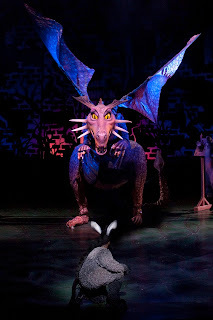 The donkey was great, as you would expect for one of the main characters. Shrek himself did the job really well, although I did find at times I couldn’t understand his singing over the voice of Fiona and the loud music. The costumes were great; the fairy god-mothers being a particular favourite of mine with all its glorious purple sparkle! The most impressive scenes by far were those involving the dragon. Seeing the 4 actors bringing this huge dragon to life across the stage, with its shining eyes and soulful singing voice was amazing; only beaten when the same dragon flew over the audiences head to land on the stage! I thought the young boy behind us would be terrified but he loved it. I think that is why it is recommended for children aged 5 and over. I know my 3 year old would have been terrified and begging to leave! The show moved along at a good pace, I didn't find my mind wandering as it has at some other theatre productions where some scenes fail to impress that much. The storyline was enough away from the original film that you didn't feel they were adding or missing parts, whilst still keeping the characters (mostly) in character. The scene changes were flawless and I was very impressed with how quickly they changed Fiona to an ogre at the end, it was fascinating watching that happen. The finale was a real feel good sing a long which saw the entire audience clapping away, made even more special by the Confetti that exploded all around us. I watched the young boy behind us collecting up the pieces to take away as a small memento of a show he clearly enjoyed. So all in all I would definitely recommend Shrek the musical as a great show for the whole family (not including those under 4 or 5). It was a real feel-good show and my friend and I left having had a thoroughly entertaining couple of hours. So a big thank you to Sharon for giving us the opportunity to go; and I am sorry you missed out!" Thanks for the review guys - sounds like you had an amazing time! 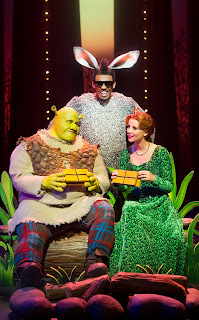 Instead of going to the show I took at the look at this video that the cast of Shrek The Musical and Centrepoint have made to celebrate Christmas. Centrepoint believe in giving homeless young people a future. To donate £2 to Centrepoint's Christmas appeal, simply text OGRE12 £2 to 70070.